An English postcard of 1919 epitomises the OED's definition of Father Christmas as "the personification of Christmas as a benevolent old man with a flowing white beard, wearing a red sleeved gown and hood trimmed with white fur, and carrying a sack of Christmas presents". Father Christmas is the traditional English name for the personification of Christmas. Although now known as a Christmas gift-bringer, and normally considered to be synonymous with Western culture's Santa Claus which is now known worldwide, he was originally part of an unrelated and much older English folkloric tradition. The recognisably modern figure of the English Father Christmas developed in the late Victorian period, but Christmas had been personified for centuries before then. English personifications of Christmas were first recorded in the 15th century, with Father Christmas himself first appearing in the mid 17th century in the aftermath of the English Civil War. The Puritan-controlled English government had legislated to abolish Christmas, considering it papist, and had outlawed its traditional customs. Royalist political pamphleteers, linking the old traditions with their cause, adopted Old Father Christmas as the symbol of 'the good old days' of feasting and good cheer. Following the Restoration in 1660, Father Christmas's profile declined. His character was maintained during the late 18th and into the 19th century by the Christmas folk plays later known as mummers plays. Until Victorian times, Father Christmas was concerned with adult feasting and merry-making. 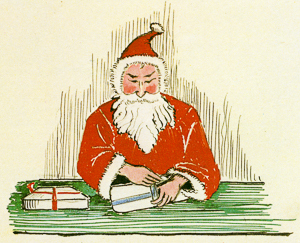 He had no particular connection with children, nor with the giving of presents, nocturnal visits, stockings or chimneys. 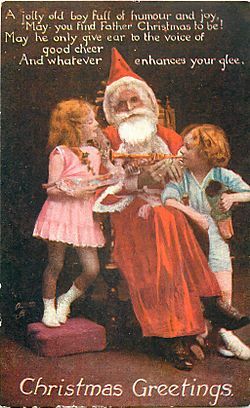 But as later Victorian Christmases developed into child-centric family festivals, Father Christmas became a bringer of gifts. The popular American myth of Santa Claus arrived in England in the 1850s and Father Christmas started to take on Santa's attributes. By the 1880s the new customs had become established, with the nocturnal visitor sometimes being known as Santa Claus and sometimes as Father Christmas. He was often illustrated wearing a long red hooded gown trimmed with white fur. Any residual distinctions between Father Christmas and Santa Claus largely faded away in the early years of the 20th century, and modern dictionaries consider the terms Father Christmas and Santa Claus to be synonymous. 'Ghost of Christmas Present' in Charles Dickens's A Christmas Carol 1843. A hunchback Old Father Christmas in an 1836 play with long robe, holly wreath and staff. An 1852 play. The Old Father Christmas character is on the far left. Father Christmas Facts for Kids. Kiddle Encyclopedia.